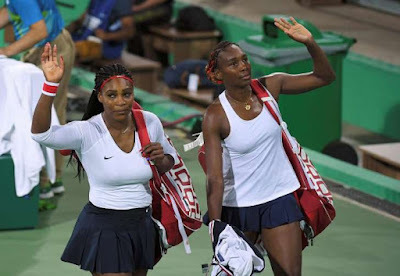 Three-time doubles champions and gold medalists, sisters Serena and Venus Williams lost an Olympic match as partners for the first time, by losing in the opening round of the Rio de Janeiro Games to Czech Republic's Lucie Safarova and Barbora Strycova by 6-3, 6-4. "We played terrible, and it showed in the results." "I wasn't playing the way I needed to play," Serena said. "I wasn't crossing the way I need to cross." Neither Safarova nor Strycova, has ever won an Olympic doubles match, going a combined 0-3 with other partners. They are even unseeded in Rio while the Williams sisters are seeded No. 1 in Rio. Strycova and Safarova only had played one match as a team before Sunday night and they lost that match which was in a Fed Cup match last year. After that defeat, which was her second one in the Olympics, Venus did not meet with reporters, because according to the U.S. women's Olympic tennis coach Mary Joe Fernandez, the seven-time major singles champion had been sick since before she arrived in Brazil.